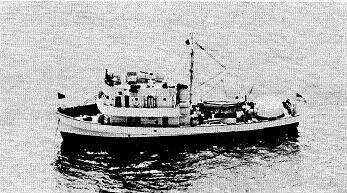 Coastal minesweepers were small vessels, often converted fishing boats with wooden hulls, used to sweep for mines in littoral waters. Because mines generally must be emplaced in shallow water, these small minesweepers were actually quite useful. The wooden hulls made them nearly immune to magnetic influence mines, and their small size and shallow draft reduced their vulnerability to mines triggered by the change in water pressure from a ship moving overhead. The shallow draft also made them less vulnerable to contact mines, which were usually moored some distance below the surface. In general, coastal minesweepers were employed in friendly waters to sweep one’s own minefields (when no longer needed) or to sweep offensive minefields emplaced in friendly water by the enemy. Displacement of coastal minesweepers converted from fishing boats ranged from 165 to 270 tons and armament was rarely more substantial than a couple of machine guns. These could be used to detonate swept contact mines. Speeds ranged from 8.5 to 14 knots and crews from 15 to 50. The United States also constructed a number of purpose-build wooden-hulled minesweepers.